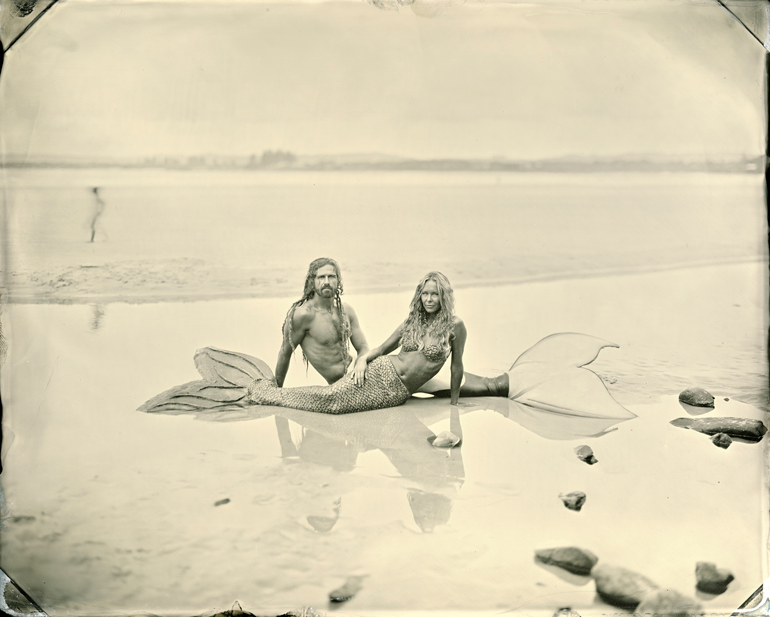 Surfland is an on-going series of direct positive, tintype portraits of surfers. The photographs are a unique blending of subject matter and photographic technique. I work with large-format cameras and the historic wet-plate collodion process that must be prepared and developed on location. The raw quality and immediacy of collodion suits my subject matter, giving it a distinctive appearance and echoing important traditions of nineteenth-century anthropological photography. My project involves an aspect of performance, as I work in the public eye. I explore the juncture between land and sea with subject matter in a constant state of transition. Surfers are an integral part of this liminal state. I am fascinated by the physical and poetic way that they inhabit America’s watery landscapes. The photographs in this series were shot in Australia, England, France and on both coasts of the United States: Montauk’s Ditch Plains on the East Coast as well as Malibu, Del Mar and Rincon beaches in California. Surfland is a chronicle and celebration of the fascinating denizens of regional surf spots across the globe.